Authored by a university professor of genetics. More importantly, I love to learn, to innovate, and to proffer effective best practices in all things pedagogy. My values: discipline-agnostic professional development in education, creating accessible learning materials, improving course material affordability, and above all else improving student interaction and inquiry in the classroom. This post accompanies a workshop that I am leading on March 9, 2019 at California State University, Fresno which is hosting the annual California State University Symposium on Teaching and Learning. A recording of the presentation will also be posted at my YouTube channel. I have recently written on the use of the Stealth Zoom tool in the ExplainEverything app to create dynamic presentations with animation. The basic idea is that only part of the ExplainEverything digital whiteboard (which I'll call the "active area") on a mobile device screen is projected via video to an audience. Every digital object (text, photo, etc.) located on what other programs would call the pasteboard (the area outside of the working area) is visible and able to be manipulated by the presenter, but the audience doesn't see this. 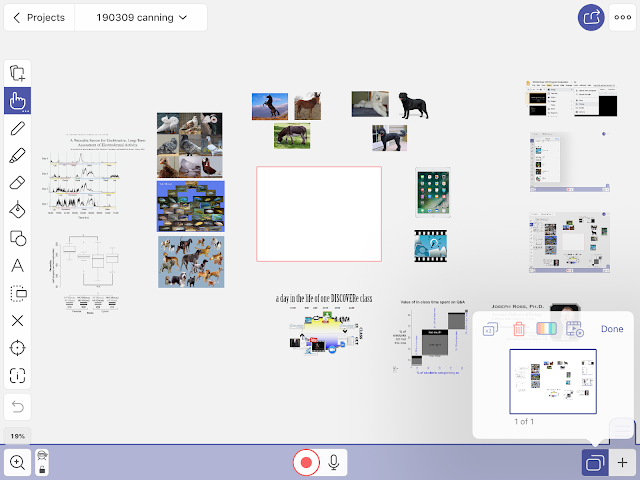 Thus, as the presenter drags an object from the pasteboard into the active area, the projection shows the object appearing from the edge of the screen. Objects can be moved by the presenter, and these motions are projected in real time, which can give the impression of a basic animation. My video tutorial here demonstrates this process. 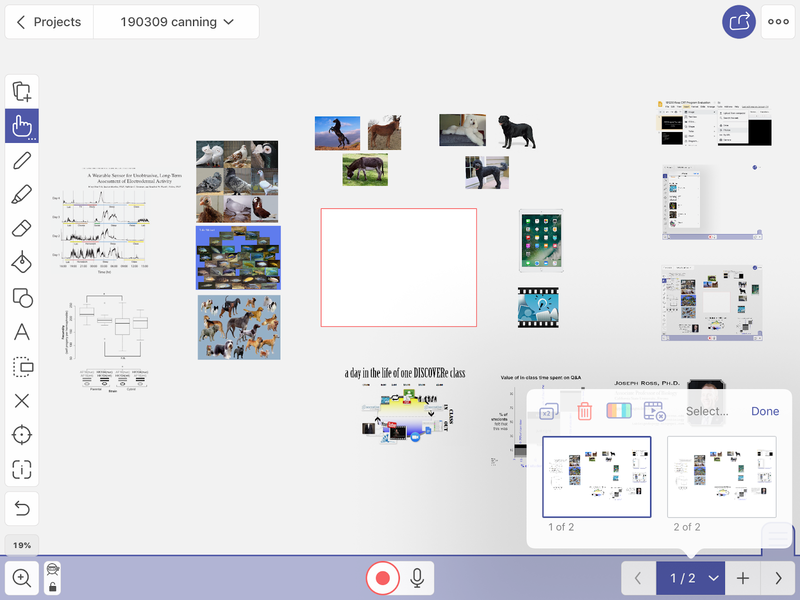 Today, I'm sharing more "best practices" for using ExplainEverything to conduct improv presentations, where graphic elements (photos, cartoons, drawings, graphs and charts, etc.) are added to a presentation depending on the direction that a conversation or classroom session goes, based on audience (or student) questions and comments. Above, you can see the ExplainEverything presentation I am using in my workshop: the white area in the center is the region that is projected to the audience. So, when I navigate to this slide in the presentation, the audience will initially see a plain white slide. Depending on what has happened previously in the workshop, I'll add one or a few graphics by dragging them into the white area. Here's the genius part: my entire presentation will be based on just this one slide (and its surrounding pasteboard, to which I've already added all of the images I think I might need). So, if I need to call on a graphic, I don't have to spend time adding it from my Camera Roll (or from Google Drive, etc. ), which takes a few "clicks" and thus can cause a brief but unnecessary disruption in presentation (see below image, which is a screen shot of part of the process of adding an existing image from my Camera Roll). In sum: I spend time before the presentation importing all of the graphics that I might use, so that the actual live presentation runs more efficiently. 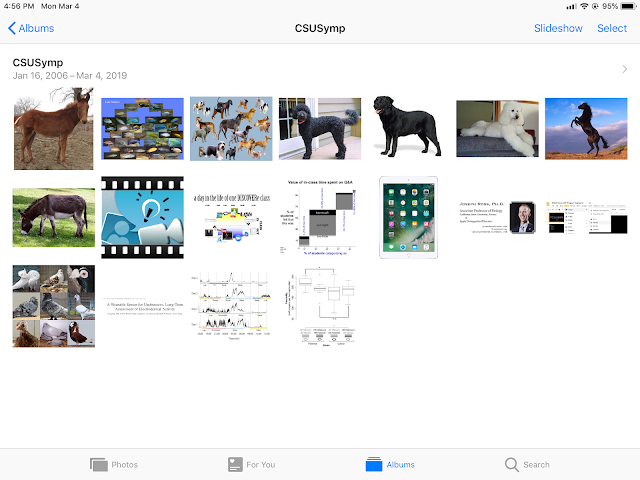 As a brief aside: for those of you who prefer not to pre-load graphics, as I did above, I suggest creating a new photo album (folder) to house only the images that you intend to use during your presentation. That way, when you are selecting an image to add (the process of which is projected to the audience), they only see all the thumbnails of images you want them to see (e.g. not also personal photographs of the family members at your cousin's birthday dinner last weekend). The other "Best Practice" I want to share today is how to leverage the graphic content of the pasteboard across your entire presentation. As I mentioned, the pasteboard (see below image) contains all of the graphics I think I will want to use in my entire half-hour workshop. I won't use all of these images on a single slide, but at the same time, I'm not sure in advance which combinations of graphics I might want to put together on a slide. That's the blessing and the curse of improv presentations! 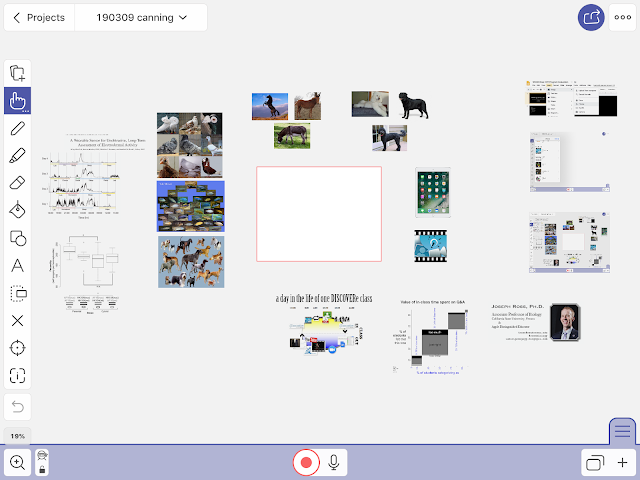 Dealing with this issue is simple in ExplainEverything: instead of pre-making a series of slides with different pasteboard content, I just load all of the graphics I think I will use, and then I just duplicate that slide (which also duplicates the entire pasteboard) every time I want to add a new slide to the presentation. There's just one trick here: if I load the white (active) area of the slide below with some of my graphics at the start of my presentation, and then I duplicate the slide when I want to move on, then I wind up having a slide that already has content on it! So, here's the workaround: before you present, make a duplicate of your blank slide + all of the pasteboard content. This will become your "template" (untouched) slide for future use. Now, the presentation proceeds thus: you start the presentation on the first slide, adding graphics as necessary using Stealth Zoom. Then, when you're ready for a new slide, you advance to the second slide. Now, before you start using the second slide, make a duplicate of it (generating slide 3)! Then you continue your presentation on slide 2 - with the new slide 3, still blank, being your new template for additional use. Continue making duplicates of your last (template) slide as needed, so that you always have one clean version of your original slide. Of course, you could make lots of duplicate blank slides before you start a presentation, and that works just fine - as long as you have a good idea of how many slides you think you'll need! But that sort of diminishes the purpose of conducting an improv presentation, doesn't it? This isn't the best way to ensure high-quality and engaging experiences for all learners. However, given increases (at least in my department and university) in the number of students enrolling, and given the lack in funding for infrastructure upgrades (read: new rooms with more seats), we face the same issue we teachers always seem to face: larger enrollments in our classes. Instead of complaining about situations that are usually perceived as sub-optimal (putting it mildly), I always prefer to take an optimistic view. I see rising course enrollments as an opportunity and a challenge to innovate how I teach. I will still make the best of the time I have with my students. Today, I'm thinking about a topic that I've been thinking (and writing) about quite a bit recently: how to perform engaging lectures. Now, that concept will sound like a contradiction to many of you. Additionally, many of us already think we present the most engaging lectures already. Nevertheless, I hope you'll read a bit more for what I hope will be a new(-to-you) spin on one technique that might help you help students understand concepts in your discipline that involve processes, flowcharts, networks, and the like. With these two points in mind, I realize now that making a set of class slides in advance subconsciously limited me. I felt like I had spent so much time perfecting the presentation already, when I got to class, I really resisted deviating from all of the great things I (thought I had) prepared for my students. In retrospect, this limited me from following avenues of exploration and discussion that might have been more pertinent (and engaging) to my class populace. These, which some might call tangents, might be the opportunities we all should seize! TL/DR: the basic tenet of the above posts is that we educators should definitely prepare for class, but not by preparing lecture slides. Instead, we could spent that prep time assembling and curating digital resources (e.g. pictures, data, diagrams…) that we can draw on during class to support the learning objective(s) of the day. By not presenting them to students, in advance, in a strict order, I've since found that students are more willing to ask questions and to suggest new avenues of discussion. 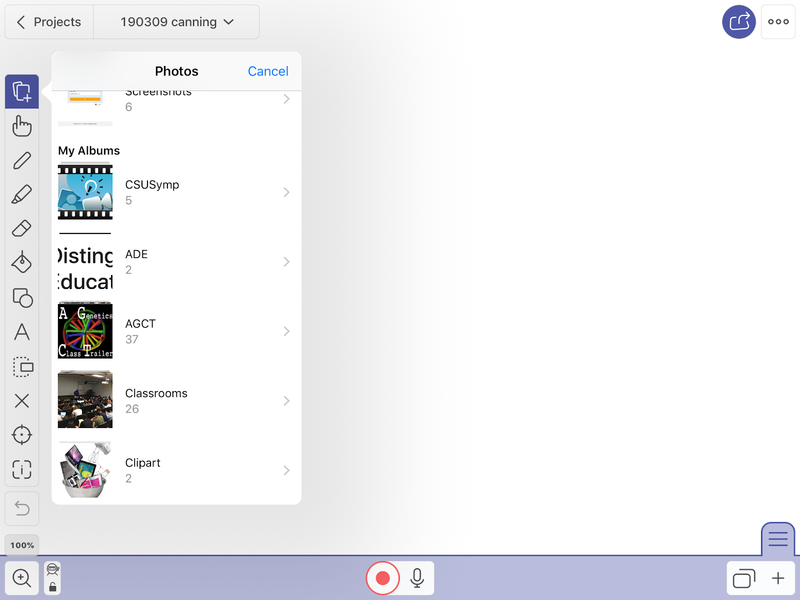 After I wrote that post (five years ago now), ExplainEverything added a feature that I only began to appreciate in the last few weeks: Stealth Zoom. I learned about this tool when I became an Apple Distinguished Educator and attended a workshop hosted by the creator of ExplainEverything. That was over two years ago, but still I only just last week used it for the first time! Brief background on this app: ExplainEverything lets you use a mobile device as a digital whiteboard. You can draw on your device and have that projected so that the entire class can see it. You can import existing graphics (e.g. photos, PowerPoint slides, PDF files) and annotate them. Meanwhile, the app can record the audio and video so that you can share a video file of your presentation afterward. 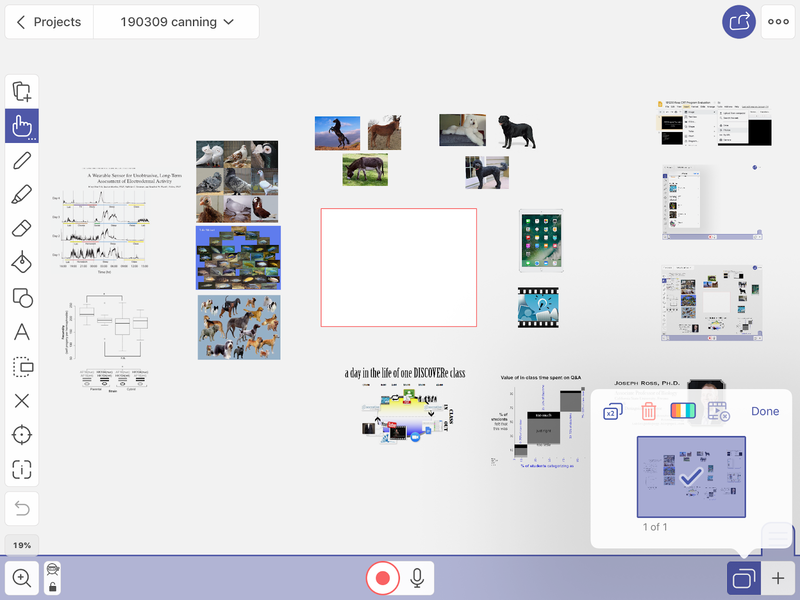 Here's the concept for using ExplainEverything for dynamic in-class presentations: you can pre-load graphics you think students might ask about, or that you think might help you explain a complicated process/diagram/pipeline/analysis. In the app, while projecting your device to the class, you can drag-and-drop these items (and move them around). When I first learned about Stealth Zoom, I was encouraged to use it to make videos that exhibited the types of simple animations you saw in the video linked above. However, my spin on this technique is that we can present Stealth Zoom-based animations live, during class, to hopefully make a more engaging and dynamic live presentation for our students. I'd love to hear how you think you could use the Stealth Zoom technique in your discipline - please leave a comment below! To the doubters: why not try a more dynamic approach to teaching? but, again (TL/DR): let's embrace such experiences as teaching opportunities that show that even faculty don't know all of the answers, and we're not experts in everything. It is great for student growth mindset to have their faculty model how to make a mistake and then correct it! Make it a teachable moment, which humanizes you and makes a huge (positive) impact on students! In years past, this was the scene: a graduate journal club course with first-year Masters students. They have read a primary (peer-reviewed, journal-published) research article in biology, and now the students must lead a discussion in the interpretation and critical analysis of the data and its interpretation. They have little experience reading six to ten pages of dense scientific prose with five to eight data-laden figures and tables. This is daunting even to the best-prepared. When I was a first-year grad student, this type of class gave me hours of pre-class sweats. I read each paper over and over, making detailed notes, so that if I happened to be called on by the professor to present one of the figures from the manuscript, I would be able to give a thorough description of the motivation of the experiment, the methods used to collect the data, how those data were analyzed, and how the authors interpreted the relevance of the outcome to their overall hypothesis. God forbid I would then be asked a more critical question, like to evaluate the choice of method the authors used (what would have been alternative approaches? why did they choose this approach? ), whether I thought that all appropriate control experiments had been performed, whether the replication of the experiment was rigorous… and I was being judged, live, in real time, in front of my peers. This was high stakes. While there may be value in such a "sink or swim" approach, I've lately become familiar with the idea that it can be beneficial to help students, especially those from the latest generations, develop a growth mindset. We do them (and society) a great service by helping them realize that it takes diligence and practice to become proficient at valuable skills, like being a critical thinker. the ability to entertain student questions skyrockets. Without prepared lecture notes, they don't know where the class period is meant to go (in their vernacular: "what content we're supposed to cover"). In my hands, at least, lecture improv has led to vast increases in student question-asking and thus to student engagement. While preparing my journal club class for the new semester, a thought struck me. What if I could accomplish these three things on the first day of class? Here's how I decided to try achieving these aims, and how it all turned out. I thought it could be an effective practice for me to perform some scientific improv on the first day of class. I asked each student to bring with them, to the first day of class, a PDF file of a manuscript related to their Masters thesis research. After I had introduced myself and performed my duty of talking about the class syllabus, we took a brief bathroom break (this is a three-hour-long class). Just before the break, I asked each student to e-mail me their article; I then asked the class to pick a number (the first respondent chose "1"). So, I told them, while they were having a five-minute break, I was going to load the figures from the 1st manuscript that had arrived in my inbox into my presentation software. When they returned, I would present, to the best of my totally unprepared ability, one of the figures from that manuscript. Scientific improv. During my five minutes of break time, I imported the PDF of the manuscript into my class presentation. When the students returned, I then spent about 45 minutes demonstrating, in real time, how I read and analyzed this example of primary research literature. This process included my looking up unfamiliar acronyms and techniques using web search engines and seeking out details about experimental replication by referring to the Materials and Methods section of the manuscript. In other words, I gave a very long and very explicit, totally unprepared, presentation of one figure from the manuscript. To reiterate, my main goal in doing this was to show students a step-by-step example of how an experienced scientist might go about learning new scientific information. I was hoping that this would help improve student growth mindset and also would be an engaging student experience for the first day of class. to "explain why it was useful"
In sum, I'm happy about the initial outcomes of this exploration of faculty risk-taking during class by performing on-the-spot interpretation of a manuscript that I had never seen before. Initial student responses suggest that I'm advancing my intended goals, and this is a potentially powerful technique that I'll continue to refine and adapt in future!